- Made of strong, tough and sturdy canvas, durable and fashionable, classic and minimalist design stand out from the crowd! - 1 Main Compartment, 2 Side Pockets, 1 big Front zipper pocket, 1 small Back zipper pocket and 2 Interior sandwich pockets are perfect for your practical needs. - Unique easy access doctor bag style opening with vertical zipper in backside provides you secret place for valuables. - Spacious main compartment with large capacity and ample room for your books, notes, computer, supplies or clothing, etc. - Adjustable padded shoulder straps deliver you comfortable carrying. - Perfect multipurpose casual daypack for working, traveling, school and daily, etc. Take it to anywhere you want to go to. What you can put in this causal backpack? - You can put 7-10 A4 books, 15.6" laptop, ipad, glasses, wallet, keys, earphone, power bank, cell phone, documents, water bottles and clothing, etc. Can my 16.5 inch laptop fit? Can it be used a personal item carry-on for travel? - As a perfect Under Seat Carry on Luggage 22x14x9 or 18x14x8 Personal Item Bag, this backpack can be used as your carry on bag. Please be assured, we offer 100% full refund if you are not satisfied. How To Maintain This Wide Open Backpack? - Wash separately to avoid staining and hang to dry. Free replacement for defectives and 100% full refund for dissatisfaction. PERFECT SIZE - As a perfect Under Seat Carry on Luggage 22x14x9 or 18x14x8 Personal Item Bag, this lightweight casual backpack can be used as your carry-on international flight. It fits nicely under the seat and is large enough to pack quite a bit into. (Spirit Airlines?Yes!) Backpack Dimension: 17H x 10L x 7W inches, Lightweight backpack weights only 0.99 lb, and with unthinkable large capacity : 20L. STRAPS - Adjustable Padded Shoulder Strap: 19.7-39.4 inches; Top Handle: 3.1 inches. Padded back panel and shoulder straps provide comfortable carry feeling. Great zip top and a top handle if you don't want to wear it like a backpack. Used it as a travel bag, school backpack, casual daypack, daily backpack, perfect for storing and toting your 15.6 inches laptop or tablet, slr camera, books, binders, suppliers or clothing etc. MULTIPURPOSE BACKPACK with LARGE CAPACITY - 1 wide open Main compartment, 1 large Front zipper pocket , 2 Side open pockets, 2 Inside sandwich pocket and 1 Back zipper pocket. Easy access doctor bag-style opening, spacious backpack with vertical zipper in back provides you a secret small pocket for valuables. BEST WIDE OPEN BACKPACK for traveling, dating, shopping, sports, going o to school, commuting to office, outdoor activities or casual life. 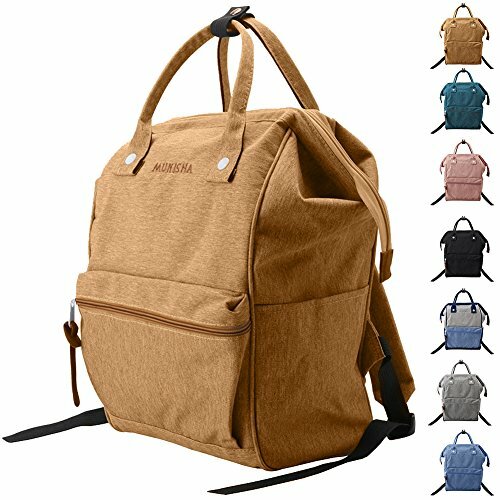 It will be a perfect school backpack bag for men and women, teens, youths, boys and girls, elementary school, middle school, high school and college students. Also as a stylish nappy backpack, baby diaper backpack bag for dad or mum, travel backpack and carry-on bag for international or intrastate travelers and weekenders. QUALITY ASSURANCE - We stand behind our every backpack, if you are not 100% satisfied, we'll surely offer you 100% full refund or life time free replacements for defectives. This is a promise. Get yours today and enjoy the new backpack earlier. FYGOOD Canvas Baby Bag Backpack for Toddler Little Kids 1-3Years old with Plush Doll Bear Dark Pink 9.4x8.2x2.3"